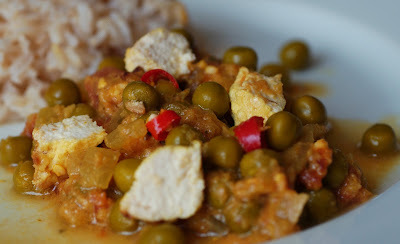 Mutter Paneer is an Indian vegetarian curry based on green peas and Indian cottage cheese (Paneer). It was one of the dishes I liked to try and cook myself at our curry night with friends the other day. It was a whole new cooking experience for me: by using yoghurt for the cooking, experimenting with the (to me still very exotic) spices (I must admit that in most cases I still don't know what spice does what to the dish - apart from chilli, that I know) and adding home-made Paneer. It turned out really nice and seemed to be popular among our guests. Served with either rice or some flat bread it makes a perfect, not to heavy main dish, that can be prepared well in advance. Make a paste by grinding together one onion, the garlic and coriander seeds. Heat the vegetable oil in a frying pan and cut the Paneer into 2.5cm cubes. Fry the Paneer to a light brown. Pat them dry with kitchen towel and leave aside. Add the remaining onion and the ginger to the oil in a pan and add the bay leaves and fry until the onion is golden brown. Add the turmeric and the paste mixture and fry until the oil starts to separate. Add the Paneer and mutter (peas) along with the yoghurt, chilli, tomato and salt. Stir for 5-6 minutes over low heat. Pour in the water and simmer gently for 20 minutes. Serve the Mutter Paneer sprinkled with Garam Masala and coriander.